60 F1’s for the big weekender at Emmen Speedway. The format was before the race not clear, but afterwards we saw that each driver would race 3 heats, and the final. the weather was quite good, a bit cloudy and a little wind. Before the meeting started all the cars were checked on their noise. In Emmen it has to be 102 dB and the law is very strict. all the english drivers had to customize their exhausts. 322 James Neachell made the trip to emmen, but didn’t take his brother with him..
26 cars lined up for the first heat of the day. 3 whites, 4 yellow, 4 blues and 10 reds.The starting grid is not good, because the English drivers are standing at the wrong grade. The race started calm, and Will Klaassen takes the lead in the first lap. The blue and red grade drivers are closing the gap to the yellows really fast, with Willem Hein de Haan and Martijn Oudhuis fighting for position three. Tom Hamer stopped at turn 3, and after the race we can see that his front axle is broken. Not a good start of his weekend. The race goes on, and 477 Martijn Oudhuis and 502 Bauke Visser are in a good fight for the lead. red roof 32 Ernst Jan Wekema spins in turn 2 and has problems with the balance of his car. Halfway the standing is: 477-502-393-541-63-88. Then a surprising move from Martijn Oudhuis, he spins and 393 and takes the lead. He makes a clean drive to the finish flag and takes the win. 18 cars in this one: 3 whites, 3 yellow, 6 blues and 4 reds. 250 Oscar Iliohan takes the lead from the start, and 132 Roy van Zuilen hits the wall very hard early in the race. 231 Mark Peters hits 215 Albert Sikkema hard and 84 Mr Mark Woudenberg fights his way to the leaders. 228 Jan Roelof Wijbenga battles with 250 Iliohan, and they spin both, so 84 Woudenberg takes the lead. he has a lead off about 50 metres to 151 Marco Falkena. 33 Siem Du Porto tries to find his way to the midfield cause a flat tire. Mark Peters gets the black flag of Mr Starter, and he also goes to the infield. 84 Woudenberg arrives at the back of the pack. The superstars in this heat can’t gain positions to the front and #3 Ouwe Bijlsma and #540 Honderd are fighting at the back op the pack. 74 Feenstra fights his way to the top 3 in the last laps, and 228 Wijbenga takes a good result in his debut year. 23 cars in the third heat, with also 4 UK drivers. 3 whites, 9 yellows, 6 blues and 5 reds. The start of this race was really hard to follow. 252 spins, and a few other drivers are piling up on it. Then UK 258 Rob Harrad and 16 John van’t Veer are fighting, and 258 spins onto the inside tires and his car is on the side. 12 van der Berg spins, and the waved yellows are out to rescue Harrad out of his uncomfortable position. Positions at restart lap 4: 635-146-226-67-23-44-337-19-11-2-uk13. 635 takes the lead at the restart, but cant keep his lead. It’s 146 Jaspers who takes the lead, and with his agressive driving style it’s a pleasure to look at. 67 Kandt moves up to the second place, and 23 Visser takes out 44 Hoekstra who is really angry. 635 Stoop cant get a long Hoekstra, and Stoop hits him hard. then again a black flag for an UK driver, 337 Willis get’s the black flag. we haven’t seen what the failure was on his car. 217 Kroonder has now moved up to the second place, and the fight in the last laps between Kandt & Kroonder is really interesting. Kroonder makes a last bender to Kandt, and he comes aside. a really close finish between 67 & 217 and Ron Kroonder wins the race by hundreds of seconds. because the nice fight of Kandt & Kroonder i can’t give the full result. We can see again the concrete, the track is not really good again. 18 cars are lining up for the 4rd heat. 2 Whites, 6 Yellows, 5 Blues and 5 Reds. Rookie 226 Pieter van der Iest, son of 26 Jan van der Iest, takes the lead in the early stage of this race. it’s a calm race and 151 Falkena moves up trough the whites on a second place. of 226. 93 goes to the infield, and also 65 Baegen is out of the race. 393 get’s a black flag in leading position, but he doesnt stop racing. now it’s 25 Paardekoper in the lead, but he also get’s the black flag..
then it is again 226 vd Iest on the first place. It’s a really confusing race with all the black flags, and after the race their is a big discussion between the race stewards and Paardekoper. However Paardekoper get’s the win, and we dont understand what is happening…. 22 cars for this one, with 4 Whites, 6 yellows, 5 Blues and 7 reds. It’s hard racing again, and the frisian drivers are fighting hard for their positions. 64 Talsma takes 43 Dijkstra out. Half a lap later hooked 64 Talsma & uk337 Willis on the main straight. 635 takes the lead, and 12 van der Berg climbs up on the fence on back straight, and he loses a few places. 19 Cars for heat 6: 2 whites, 4 yellows, 6 blues, 7 reds. 61 Maris puts 23 Visser wide, and 61 spins. 228 Wijbenga takes the lead off the start, and 250 Iliohan in second. 228 goes wide in turn 1 and 250 takes the lead. 832 Schutter isnt in a good form and he spins again. then 250 Iliohan has a mechanical failure, en he stands still on back straight. so it is 16 Van’t Veer who takes the lead, followed by 23 , 90 and 17. 322 Neachell is in a good fight with 61 Maris and 13 Ford. Neachell gets a flat tire,17 Hiddinga spins and loses a few places. 16 Van’t Veer is out from leading position, havent seen what happend to him. Now it’s 23 Visser in the lead and he can make it complete. After 2 wins on Sint Maarten, he also wins on Emmen this year..
16 Cars for this one including 3 whites, 3 yellows, 5 blues and 5 reds. Rookie 228 Wijbenga takes the lead from the start. 231 Peters fires 215 Sikkema and heat winner 25 Paardekoper has not much luck in this heat and he flies over the tires on the inside of the track. together with #19 Zwerver he piles op in the middle of Turns 3-4. 22 Wobbes spins 76 Gietema into the midfield, a dirty move from Wobbes. and after that Wobbes cant hold the corner, en he follows in by Paardekoper. Caution in the middle of the race because of Paardekoper. 93 De Buck takes two positions at the restart by passing 223 & 348 on the outside. 215 Sikkema spins on the lap and has to follow the back of the pack. On the back of the pack is a great fight between 3 great drivers, 22 Wobbes, 26 vd Iest and 231 Mark Peters. 231 takes the win of that fight and the 2 dutch superstars can dry their eyes. Position order is still 226-93-146-179 and 348 Tesselaar is out of the race. 11 hits 146 hard on the backbumper, and takes position 3. Black Flags are given again, this time 93 De Buck get’s it, as the race goes on. it’s 11 Pietersma who takes the lead and 179 follows. 226 is out of the race. 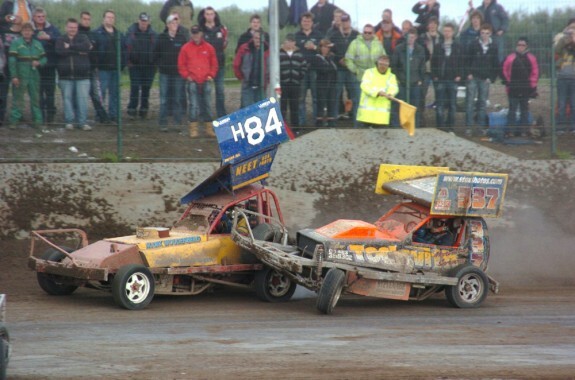 231 Peters hooks up with another dutch superstar, 76 Gietema. 11 Onno Pietersma takes the win. at the back of the field a last bender from 22 Wobbes on 26 vd Iest, and vd Iest spins and loses again 2 places. 21 cars lining up for the 8th heat. 2 whites, 6 yellows, 3 blues and 10 reds. uk215 starts at the red grade..
502 Visser takes the lead of the start, and 102 Vronink loses his tire on turn 4. 332 pushes 502 and 393 Elzinga get’s the first place. 33 Good Old Du Porto takes uk215 Nicholls out ,and in the last lap 832 Schutter spins. 477 takes the win, and just after the finish his car doesnt do anything..